Although pursuing a wrongful death action will not return your loved one, such action is necessary to hold the at-fault party accountable. In many instances the loss of loved one leaves family members suddenly without a source of income, and with unexpected expenses, such as funeral, burial and hospital bills. 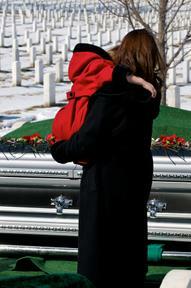 As an experienced wrongful death attorney, I will help you obtain the maximum compensation for your loss. The loss of a loved one is one of the most difficult experiences someone goes through in their lifetime. When the loss is sudden and unexpected, the experience is made that much more difficult. Your thoughts should be with the person you have lost, and not on the legal practicalities that arise. When one of those decisions is whether or not it is appropriate to pursue a claim against a person or company believed to be responsible, the first step is determining the right attorney to assist you. The right attorney is one who is not only competent to handle the case, but with whom you feel you can have a strong working relationship. Who May Bring A Wrongful Death Action? An action to recover damages is for the exclusive benefit of the surviving spouse, children, and parents of the deceased. Further, the surviving spouse, children, and parents of the deceased may bring the action or one or more of those individuals may bring the action for the benefit of all. Under Georgia law, individuals have the right to recover "the full value of the life of the decedent without deducting for any of the necessary or personal expenses of the decedent had he lived." O.C.G.A. 51-4-1. The "full value" is not only those items having proven dollar values, such as lost earnings or medical expenses, but also include the loss of more general items which value cannot be precisely quantified. The judge will instruct the jury that the amount to be awarded should be determined by their "enlightened conscience." There are many different types of damages that a claimant or claimants may be entitled to recover. Determining the appropriate value of a "wrongful death" is complicated. This requires evaluating the nature and extent of the injury which led to the unfortunate loss, the economic losses that are recoverable, and the full extent of the other person or company’s responsibility for your loss. Since insurance companies have vast experience in evaluating wrongful death claims and will seek to pay the lowest compensation possible, it is important to have an attorney on your side with considerable experience dealing with insurance companies. It is always best to have an attorney who will not settle your case for anything less than its full value. If the insurance company or at-fault person or company is not being reasonable in their valuation of your case, you need an attorney who will fight for you, who will file a lawsuit, take your case to trial and prove why you deserve to be compensated. Our law firm will do that for you. We are very sorry for the loss which you have suffered which has led you to this portion of our website. If you believe we may be of assistance to you and you wish to discuss your situation with an experienced attorney without any charge or obligation, click here to contact my office.